Complete the text using a word or phrase from the box . There are TWO words you will not need . Driving along the in busy , the driver suddenly presses a button on his . The car is now driving itself. This may sound like something from the future , but cars are already reality on California's roads. Many cars can already themselves on the roadside, automatically when the car needs to slow down, and warn the driver if they are slipping out of the right , so going driverless is just the next step towards driving. Driverless cars are equipped with fast broadband , allowing them to other cars safely , and even communicate with as they approach . Being stuck in could become a thing of the past, as driverless cars will be able to drive much closer to each other. 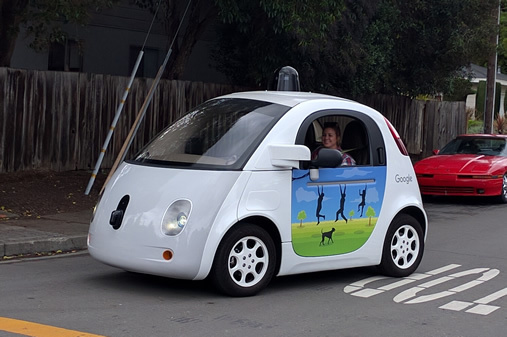 More than fifty million people die or are in road accidents every year, and the majority of these accidents is caused by human error.Google's driverless car sticks to the and doesn't get tired. So wouldn't it be a great idea if all cars were driverless ?